Republicans were hopeful Tuesday night as the doors to the polls closed in Washoe County. Supporters of Republican Attorney General Adam Laxalt awaited the election results in a ballroom at the Grand Sierra Resort in Reno. After months of campaigning for the conservative lawyer who tied his chances of winning the governorship to President Donald Trump, organizers gathered there seemed optimistic. The two Republican candidates at the top of the ballot had strong ties to Northern Nevada, usually a boon for candidates trying to win historically swingy Washoe County. Laxalt summered at Marlette Lake as a child with his grandfather, former Gov. and U.S. Sen. Paul Laxalt. 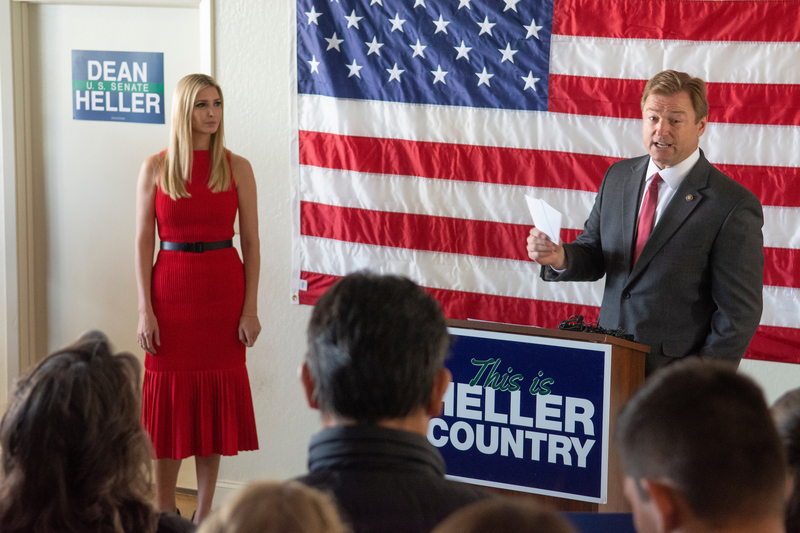 U.S. Sen. Dean Heller, running for re-election, spent almost all of his childhood and much of his adult life in Carson City, just a half hour from Reno. Their Democratic opponents were southerners: Steve Sisolak, the longtime Clark County commissioner and vociferously pro-South university regent running against Laxalt, and Rosen, the first-term congresswoman representing parts of Las Vegas and Henderson challenging Heller. Turnout in Washoe County hit a record high for an off-year election, with 70.1 percent of active registered voters casting early ballots or flocking to the polls on Tuesday. Nearly three hours after polls closed, voters who had arrived before 7 p.m. were still waiting in line. Since Nevada only releases results once everyone has cast their ballots, anxious Laxalt supporters at the Grand Sierra also waited. At 10 p.m., results started coming in from across the state. Things looked good at first, as several ruby red rural counties reported results from two weeks of early voting. As expected, they showed a Republican sweep. Laxalt and Heller were leading by more than 40 percent in some counties. And then early voting results from Washoe County were reported to the ballroom. The two Southern Nevada Democrats posted significant leads in Washoe County, where Republicans have a slight registration advantage and where voters often pride themselves on steering clear of politicians that live in the south. Rosen was up by 10 and Sisolak up by eight. To win Tuesday night, statewide Republicans would have had to do well enough in Washoe County to surmount the firewall that Democrats had built in left-leaning Clark County, where more than 70 percent of the state’s population lives. The Grand Sierra ballroom emptied out shortly after, as it became increasingly clear that Laxalt would have to concede. By the end of the night, only three statewide Republicans had won Washoe. 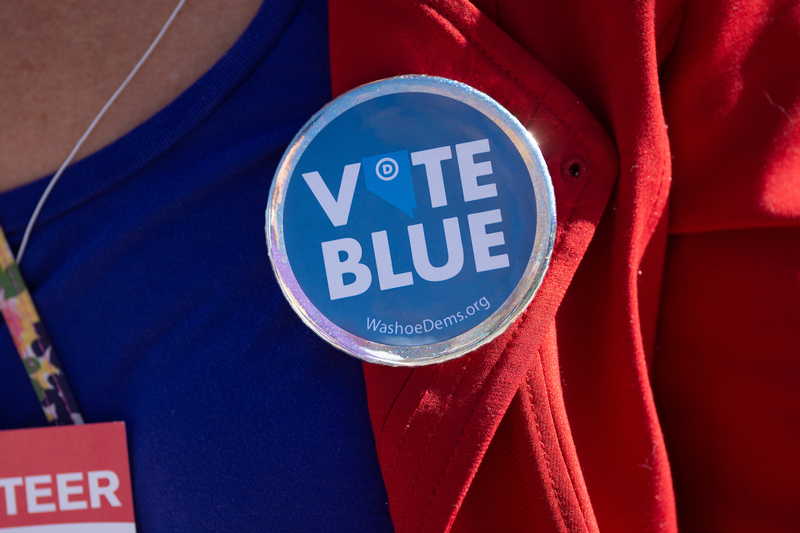 Washoe County went blue, and so did the state. Washoe County used to be solidly conservative. But in recent years, it has emerged as the state’s only swing county, a fact that has often resulted in split tickets. In 2010, former Senate Democratic Leader Harry Reid beat Republican Sharron Angle in Washoe County, while Republican Brian Sandoval swept Clark County Commission Chairman Rory Reid in the governor’s race. The same thing happened in 2012 when President Barack Obama, a Democrat, took Washoe County, at the same time that Sen. Dean Heller, a Republican, won his first full term to the Senate. Again in 2016, former Secretary of State Hillary Clinton won Washoe as Rep. Joe Heck, a Republican, won in the county. This year marked a departure. There was no split ticket. Instead, the Democrats in two marquee races prevailed in Washoe County by several percentage points. Despite a Republican registration advantage of about two percent, Rosen beat Heller in Washoe by nearly four points and Sisolak beat Laxalt by slightly more than two points. There is no question that Washoe County’s voting patterns have changed. But the question many are now asking is whether this year was a blip or indicative of a permanent shift toward the Democratic Party. What accounted for this year? Demographics? Messaging? Trump? The county plans to release party turnout numbers on Tuesday, but given the registration advantage, it is clear that independents, and probably some Republicans, voted for the Democrats. “If I’m a Republican analyst after this election, I need to get in touch with the state’s demographics,” Herzik said, especially the fact that more Californians are moving to Reno for jobs or to escape high taxes and as Reno markets itself as a more hip and urban destination. One Republican official said Californians coming to Nevada in search of a friendlier tax climate may be continuing to vote blue as they did in their home state. The official said that the loss for Republicans on Tuesday night could be the beginning seeds of the “California creep” into Washoe County. Throughout the campaign, Heller and Laxalt warned voters that if they elected Democrats, it would turn Nevada into “East California,” with higher taxes and more regulations. David Damore, the chair of the UNLV political science department, said the message fell flat. But Washoe County has been trending Democrat for longer than many think. In 2008, when Obama beat Sen. John McCain in Washoe County with 55 percent of the vote, Democrats had a slight 2,000-person voter registration lead in the county. Since 2000, the numbers of active registered nonpartisan voters has increased significantly. Voters in Washoe County also care about individual candidates and their campaigns, something that was apparent when analyzing the results of how partisan politics played out in down-ballot county races. During a midterm election in which the Democrats were successful at the top of the ticket, Republican incumbents won all but one county administrative office. Such down-ballot ticket-splitting was apparent in Democratic Assemblyman Skip Daly’s re-election race. According to The Nevada Independent’s early voting blog, Republicans had a more than 550-vote lead in the Republican-leaning district based on early voting turnout. But when the early vote results came in, it was Daly with a roughly eight-point lead over former Republican Assemblywoman Jill Dickman. The results suggest that Daly won a large percentage of the independent vote and likely pulled in some Republican voters, too. Sarah Mahler, the chair of the Washoe County Democratic Party, said she was surprised that Daly won, given the tough headwinds he faced in the Assembly district. “That was a success for us,” she said. Mahler believes that the election this year was not a blip, but also that Trump, who visited the state to stump for Heller and Laxalt three times, affected the results. She said that disapproval of Trump likely influenced the votes of Democrats and moderate independents. Trump, she said, also played a role in helping local Democrats better organize. After 2014, a devastating year for Democrats across the state as Republicans swept all six constitutional offices and control of both houses of the Legislature, Mahler said she has watched as local Democrats have become reinvigorated and willing to devote more time to campaigning. There are multiple theories among Republicans about why Washoe went blue this year. One is demographic shifts. Another, which longtime Republican strategist Pete Ernaut subscribes to, is that Republicans simply aren’t talking about the right issues. Ernaut said the Republican path to victory in Washoe County runs through female voters, but that his party isn’t doing enough to appeal to them. Republicans have a “systemic” problem appealing to women, he said, particularly on issues such as health care, education, immigration and gun safety. Ernaut said that there isn’t a lot of policy for them in the Republican Party right now. “If the Republican Party doesn’t modify and focus on women voters, it’s going to be a long time before they win statewide in Nevada again,” Ernaut said. Ben Kieckhefer, a Republican state senator who represents part of Washoe County and Carson City, echoed Ernaut, saying the party should “do a deep dive” into its strategy in the region. But in Kieckhefer’s opinion, the election this year was less a rebuke of state Republicans like Gov. Brian Sandoval, a popular moderate, and more a reaction to national politics. Ernaut believes that the path forward for Republicans in the state begins in 2019 and starts with health care. Despite Democratic control on both chambers of the Legislature, he said that Republicans have a chance to prove themselves by tackling issues such as pre-existing conditions, Medicaid and pharmaceutical company transparency. The outcome of the election in Washoe has left Democrats cheering and Republicans seriously rethinking what went wrong in two top of the ticket races they thought had been too close to call. The Nevada State Democratic Party attributes its success in the traditionally swingy north to the aggressive campaign-style field operation it ran on top of the existing infrastructure it has — an office and a full-time staff member — year in and year out in Washoe. Alana Mounce, the party’s executive director, said stationing organizers in Washoe and, specifically, on UNR’s campus allowed the party to build a robust volunteer infrastructure early that allowed it to run the kind of get out the vote effort it did in the final days of the campaign. That infrastructure also allowed the party to expand the universe of voters it was targeting in its get out the vote program to include more infrequent voters. 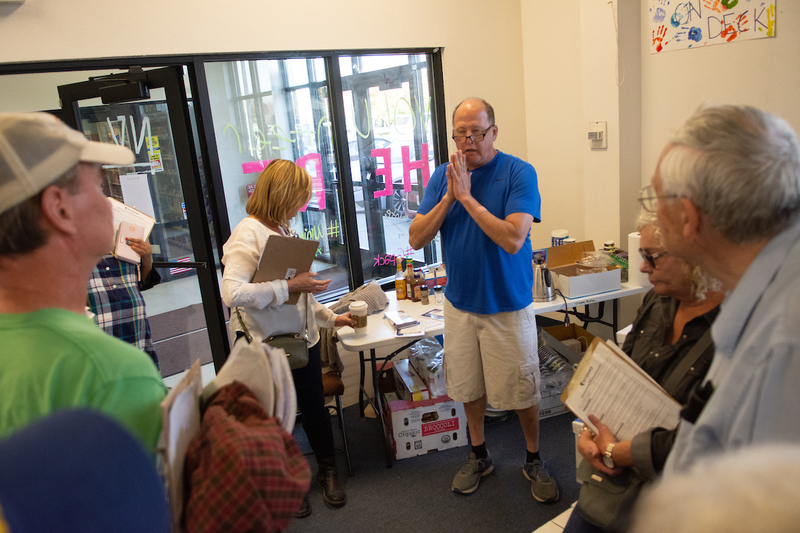 Mounce said that the party was able to do four passes of its infrequent voters list in Washoe County in the final four days of the campaign — meaning a Democratic Party volunteer knocked on each infrequent voter’s door four times in four days — while it only did two or three passes of that list in Clark County, depending on the part of town volunteers were canvassing. In fact, Mounce said that at one point during the final four days of the campaign a volunteer walked into the Democratic Party office in Washoe wanting to knock on doors and the party simply had no work for the person — every single walk packet had already been sent out — and the person was enlisted to make phone calls instead. Sarah Adler, a Carson City lobbyist who helped organize Sisolak’s field operations in Northern Nevada, emphasized the role that the party’s infrastructure played in putting Sisolak, a Southern Nevada Democrat, at a lead in the traditionally more conservative Washoe County. She noted that the party trained precinct captains in many Washoe County precincts. From the campaign’s perspective, Adler said that the organization provided a “rapid access mechanism” for Sisolak organizers to target specific areas of the county. “I would interpret the outcome as the person-to-person contact defeated the negative television ads,” she said. For Republicans, the loss in Washoe is all the more stinging because of how organized their party was in the state this year. The Republican National Committee landed on the ground in Nevada early — in June 2017 — to build up networks of neighborhood volunteers in all 17 counties across the state and register voters. Rick Gorka, deputy communications director for the Republican National Committee, attributes Republicans’ losses in Washoe to a demographic shift. “There’s no doubt that Washoe has changed over the last two years and that Republicans need to take a deeper look at what it’s going to take to recruit, train, organize and activate our base and candidates to be successful there moving forward,” Gorka said. Updated at 12:00 p.m. to reflect that three, not two, Republican candidates won Washoe County and that the Democrats did not have a precinct captain in every county precinct.